A series that will show you how to develop modern applications with Golang and Angular. TL;DR: In this series, you will learn how to build modern applications with Golang and Angular. In Part 1 - The Backend - Developing and Securing Golang APIs, you learned how to build a secure backend API with Golang to support a to-do list application. 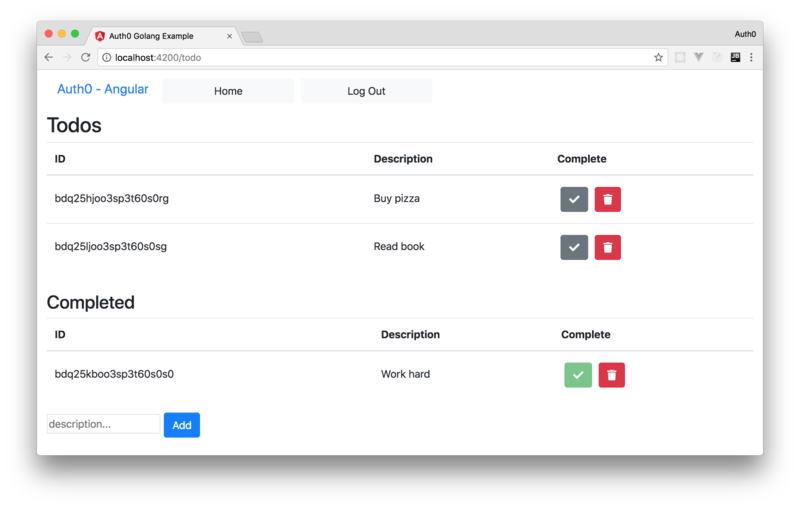 Now, in the second part, you will use Angular to develop the front-end of the to-do list app. To facilitate the identity management, you will use Auth0 both in your backend API and in your Angular app to authenticate users. If needed, you can find the final code developed throughout this article in this GitHub repository. "I'm developing a modern application with @angular and @golang." For this tutorial, you will need to install Golang, Node.js, and Angular. However, as you will see, the process is quite simple. For starters, you can visit the official installation instructions provided by Golang to install the programming language. After that, you will need to install Node.js (which comes with NPM). For that, you can follow the instructions described here. Note: By adding -g in the command above, you make NPM install the Angular CLI tool globally. That is, after issuing this command, you will have the ng command in all new sessions of your terminal. In the first part of this series - Part 1 - The Backend - Developing and Securing Golang APIs - you have developed a secure backend API with Golang and Gin. If you have followed the previous article, you can jump to the next section. Otherwise, you can still follow this article along. However, you will have to fork and clone this GitHub repository and, after that, you will have to sign up for a free Auth0 account here so you can properly configure and run your backend API. and click on the Create button (leave the Signing Algorithm with RS256). Note: You will have to replace <YOUR_AUTH0_API> with the identifier you set in your Auth0 API while creating it. Also, you will have to replace <YOUR_AUTH0_TENANT> with the subdomain you chose while creating your Auth0 account. 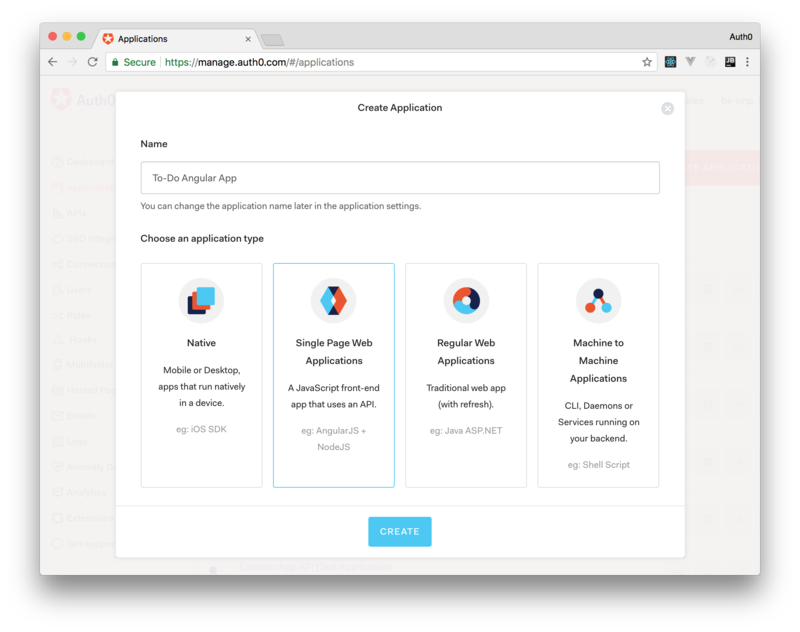 Now that you have your backend sorted out, you will proceed with the creation of the front-end app with Angular. This application will consist of a simple home page with a button to redirect users to the to-do list. To access this list, users will have to be authenticated. The last command issued will look at the package.json file and see what are the dependencies defined there so it can download everything. Then, the last change that you will have to do is to edit the environment files found inside the ./ui/src/environments directory. These files will act as global variables for your application and distinguish between whether you are running a local development environment or if you are running in production. Now, as you already created your Auth0 API in the last part of this series, you can replace <YOUR_AUTH0_API_IDENTIFIER> in both files (for example, you can replace this placeholder with https://my-golang-api). In the next section, you will create an Auth0 Application and then you will be able to replace the other placeholders used above with your own Auth0 values. Name: You can name your application with anything that might help you identify it in the future. For example, "To-Do Angular App". Application Type: For this one, you will have to choose the Single Page Web Applications option, as this is exactly what you are going to create. Then, when you hit the Create button, Auth0 will redirect you to the Quick Start section of your new application. From there, you will have to move to the Settings section so you can finish configuring your application. So, now that you are in the Settings section, search for the Allowed Callback URLs field and insert http://localhost:4200/callback there. You need this configuration because, after the authentication process, Auth0 will only redirect users to the URLs listed in this field (this is a security measure that Auth0 puts in place). After that, you can hit Save to persist the change and leave this page open. You will copy values from it in a moment. <YOUR_AUTH0_TENANT>: In the place of this placeholder, you will have to insert the Auth0 subdomain you chose while creating your account. In the end, you will have something similar to domain: 'pungyeon.auth0.com'. <YOUR_AUTH0_APPLICATION_CLIENT_ID>: In the place of this placeholder, you will have to insert the value that Auth0 shows in the Client ID field of your new application. This will be a random string similar to z4Z09pinlP93aqTVaIBkCzzQ9vjZ6eEX. Note: You have to make sure you replace both placeholders on both files. Otherwise, you might end up with a buggy sign-in feature. Note: The command above is the shortened version of ng generate component home. home.component.css: This is the CSS file that will allow you to style your new component. home.component.html - This is the HTML representation of your new component. home.component.spec.ts - This is where you would write automated tests for your component. home.component.ts - This is the main piece of your component. Note: The CLI will also automatically add this newly created class to our app.module.ts, in the @NgModule.declarations section. In this case, all you are doing is creating a title and a link that will redirect users to the /todo route. You haven't determined the routing yet, so that won't work right now. You will get to that soon. For this article, you will split the to-do functionality into two things: a component (the one you just created) and a service. The service will be in charge of issuing HTTP requests to your Golang backend API. After creating this service, your component will be able to use it to communicate with your backend so it can display the correct information retrieved by the service. In the new version of this file, you are stating that you want to export your TodoService class, thereby making it available for other components to use. On the initialization of this class, you are defining that it needs an instance of HttpClient. Then, you are defining four methods to issue HTTP requests to your backend API: getTodoList, addTodo, completeTodo, and deleteTodo. Note: The @Injectable() decorator ensures this class is available to Injector for creation. Also, at the bottom of the file, you are exporting a class called Todo, which is a mirror of the todo structure you used in the backend. You use this class throughout your project to ensure a more accurate description in code of what you are sending and receiving from your backend. One important thing to notice in this service is that you are using the environment.gateway variable to determine where your HTTP calls are headed. This makes running the same code base in different environments easier. Starting from the export class TodoComponent, what you have is three properties that respectively contain your activeTodos list, your completedTodos list, and a todoMessage that will hold data inputted by users. Then, you have the constructor of your component, which is expecting a TodoService instance and that stores it as a private property called todoService. Then, the first function of your component, ngOnInit, is a built-in standard of Angular and derives from the interface OnInit. Essentially, the implementation of the OnInit interface will wait for the component to be loaded before executing the ngOnInit function. Then, ngOnInit will retrieve data from your backend with the help of the getAll method. This method, will invoke the todoService.getTodoList function. As you know, this function is an HTTP call to your backend to get all of your todo items. So, the getAll function subscribes to data from the todoService.getTodoList and, whenever data is received, it assigns all active todos to your activeTodos property (by filtering out any complete items) and do the opposite for the completedTodos property. The rest of your class methods are corresponding to your TodoService, which in turn was mapped up against your backend API. In other words, you have functions to add, complete, delete, and update your to-do lists. Basically, your to-do page consists of two tables that use the *ngFor directive to iterate over all the to-do items in activeTodos and completedTodos. These tables contain the id and message of the to-do items, as well as two buttons that allow users to complete and delete items. Also, this page indicates whether the to-do items are completed or not. This happens in the usage of *ngIf directives. If the todo.complete property is false, this page shows an active green button and, if the todo is already completed, it shows a grey disabled button. At the very bottom of this HTML page, you have an input text and a button that, when clicked, triggers the addTodo function. This is what gives your users the possibility of adding new to-do items. The input content is mapped to the todoMessage property via the ngModel directive. This directive works like a two-way data binding, meaning that the property is tied to the input element and the element is tied to the variable. In other words, should one change so will the other. If you were to spin up your project now, none of your hard work would show. That happens because you are not routing your clients anyway and, even if you were, they are not authenticated to get the to-do list from your backend. In the next section, you address both issues. As you can see, you have the familiar @Injectable() decorator that makes this service injectable into other components. Then, you define three string properties and a single auth0.WebAuth object. This object is what is used for authenticating against Auth0. As such, you will need to use the information from your environment files with this object to send your users to Auth0 and to inform which application they are trying to get access to. Your login function is quite simple looking but, essentially, this will initialize the authentication process on Auth0. If the user is authenticated, Auth0 will send them to the specified callback location with a tailing hash on the URL. Then, auth0-js will parse this hash with the parseHash function. If everything goes ok, your code will call the setSession function which will set three properties with the appropriate values: access_token, id_token, and expires_at. The lougout function resets all tokens from memory and the isAuthenticated method just returns whether the token has expired or not. You will use this information later while getting an authentication status of your user. Lastly, you have the createAuthHeaderValue function, which returns a string in the form of an Authorization bearer header. All you are doing here is to invoke the handleAuthentication method of your authentication service once the component is initialized. As you learned, this function parses the URL hash and redirects users to the /home route. Once you have set your authentication session with your callback component, you will need to make sure that all future requests include the token retrieved from Auth0 in the Authorization header. To do this, you will create an Angular interceptor. This interceptor service intercepts (of course) all of the outgoing HTTP requests and add an authentication header if a token is available. To do this, this interceptor implements HttpInterceptor, which has the constraint of needing the intercept function. This function is then invoked upon an HTTP request. Much like the middleware in your backend, this will return a next.handle, which basically forwards the modified request to the original destination. The intercept function, in this case, is quite simple. You are cloning the incoming request to add an Authorization header. Remember, if no token is found, nothing is added. Once the request has been altered, this interceptor invokes the next.handle passing the modified request. The reason why you are creating this interceptor is to ensure that all of your requests contain the appropriate Authorization header. Centralizing the header management like this makes it easier in the future. If changes are made to authentication or if new requests are added to the project, no changes are needed. The only important aspect of this file is your routes constant. This constant defines an array of paths. The root ('') path will redirect to your HomeComponent, the todo path will redirect to the TodoComponent, and callback to the CallbackComponent. However, as you will notice, the todo path is slightly different in that it is using the canActivate property and using AuthGuardService. Well... you haven't written the AuthGuardService yet. So, you can do that right away. This is actually a really simple service. This service simply calls the AuthService asking whether the current user is authenticated or not. If the user is authenticated, it returns true, forwarding the user to the request route. If not, it will invoke the auth.login function, which will send your user to the Auth0 login page. For the routing, as you can see, you have imported the AppRoutingModule class. So, now you can finally include this routing to your application, which will be the last part of this tutorial. Here, you are creating a new navigation bar including functions from AuthService to allow users to log in and log out. Underneath this navigation bar, you are including the router-outlet component inside a div.container-fluid element (this is part of Bootstrap). The outlet element is what tells Angular to ask to the routing module which page it should load. It's a very common practice to include the navigation bar together with the routing component. This ensures that the menu is present on all of your pages, without having to reload the navigation bar for each individual page. Then, open a new terminal window and go to the project root. There, you will just need to tweak one more configuration. As you backend runs on a different "domain" (http://localhost:3000) than your Angular app (http://localhost:4200) you will have to enable Cross-Origin Resource Sharing (CORS) in your Golang backend API. Note: You have to replace <YOUR_AUTH0_API> with the identifier you set in your Auth0 API while creating it. Also, you have to replace <YOUR_AUTH0_TENANT> with the subdomain you chose while creating your Auth0 account. Then, if you click on Log In or on Show Todo List, your app will redirect you to Auth0 so you can authenticate. After authenticating, Auth0 will redirect you back to your app so you can proceed using it. When properly logged in, you can click on Show Todo List and start using your app. "I just finished building a full-stack app with @golang and @angular." So, you finally made it! The application that you created was pretty simple. Just a to-do list where you can add, delete, and complete some to-do items. However, the framework around your application is quite sound. You have handled authentication via Auth0, creating a very strong starting point for your application, by starting with security in mind. Adding features to your application becomes a lot easier once you have established a strong fundament in security. You can add different to-do lists for different users relatively easily without having to worry about how this will affect your application down the road. Using a third-party security solution like Auth0 is also a great advantage because you can rest assured that this solution will keep your application data safe. With a few changes here and there (such as serving our API and static files over HTTPS), you could quite confidently deploy this code to production. I hope this series has been helpful and that it has given some insight on how easy it is to implement a full-stack application with Golang and Angular. Feedback and questions are very welcome!